Natural compounds are increasingly important in many research and development areas. Their structural diversity is supplemented by the synthetic potential of combinatorial chemistry. New classes of substances to be discovered, the highly diversified nature of these compounds and their chiral properties hold the promise of numerous market opportunities to whoever can find them first. This reservoir of nature is almost inexhaustible. Pharmaceutical research is just beginning to exploit it at a larger scale. Access to the inexhaustible reservoir of natural compounds has become much wider in recent years. However the same does not apply to the respective methods of automatic processing. Fractionation and separation of samples obtained from nature remain time-consuming, tedious and extremely expensive, even though the assays for testing these samples have become faster and cheaper thanks to advanced high throughput screening processes. Processing natural product extracts proves to be a major bottleneck in the process of drug discovery. To ensure that sample preparation is both reproducible and reliable, it would therefore be of immense benefit to have an automated process in place of natural compound purification. The economic potential of this is tremendous. 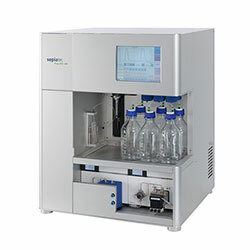 Sepiatec’s unique Sepbox systems allow samples to be processed automatically, and significantly accelerate the purification process. Results which usually take weeks or months with conventional methods can be obtained in just a few days - or even one day - with a Sepbox system. 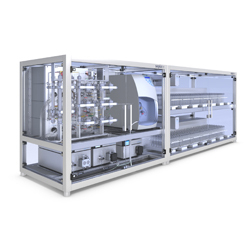 The automated Sepbox 2D-250, 2D-2000 and 2D-5000 systems allow extracts from plants, marine organisms, microbiological or animal materials to be processed in quantities of upto 250, 2000 or 5000 milligrams respectively. The systems are equipped with two detectors: UV detection (ultraviolet) and optional ELSD detector (evaporative light scattering detection) which can detect almost all substances. The system offers the choice between liquid and adsorbed (solid) sample injection. Up to 600 fractions can be collected in microtiter plates in just 24 hours. Depending on the extract, up to 30 percent of all fractions usually contain pure compounds. The system is equipped with intuitive, user-friendly software for method development process control, data acquisition and data analysis. The Sepmatix 8x System Screening HPLC from Sepiatec only uses one external HPLC pump. The flow is separated by the patented Sepmatix Flow Control into eight channels, and the flow in each channel is precisely measured and regulated throughout the entire run. Together with an autosampler and a detector with 8 independent spectrometer modules working in parallel. The result is an unbelievably compact HPLC system, which will instantly enhance the throughput of every research and development laboratory eight times over. It is not necessary to spend time adapting methods to the new system or to purchase any new costly HPLC columns. Different designs of the Sepmatix 8x System Screening HPLC are available for applications such as chiral column screening, protein screening, method development, or with an 8x Fraction Collector for preparative work. 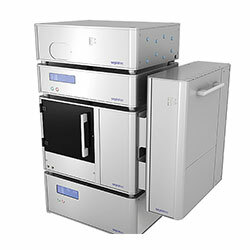 It is a robust unit that can be set up even in cramped lab surroundings and can perform up to eight HPLC runs at the same time. The Sepmatix 8x Screening SFC system combines Sepiatec’s proven parallel HPLC technology with the advantages of supercritical fluid chromatography. The result is the first SFC system with eight separating columns working in parallel, high operating speed and as yet unmatched performance. In a space of only a few minutes for example enantiomers can be separated on eight different chiral columns at the same time. The automatic variation of the eluents makes it possible to determine the optimal chiral separation in a significantly shorter time than was previously possible. The superb Screening Wizard Software clearly displays the separations achieved in up to 80 chromatograms at the same time. The separation with the best peak resolution is immediately discernible. The software considerably reduces the amount of time the user needs for the selection process. The overview display is extremely suitable for presentations. As far as the Sepmatix 8x SFC systems technical features are concerned, only one CO2 pump and one modifier pump are needed. Using Sepiatec’s patented Flow Control the flow is divided into eight channels and regulated exactly by electronically controlled valves. A back pressure regulator, an autosampler, an eight channel diode array detector and a column oven for heating and cooling purposes are part of the standard equipment. With minor modifications the Sepmatix 8x SFC system is also suited to chromatography using organic solvents. 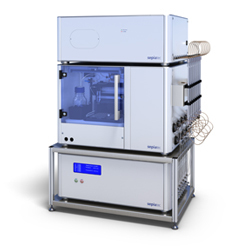 Sepiatec’s Prep SFC 100 system is a compact benchtop unit designed for preparative separations using supercritical fluid chromatography. Measuring just 70 x 60 x 88 cm (W x D x H) the system offers all the advantages of SFC technology such as fast separations, reduced consumption of organic solvents, lower costs, improved environmental compatibility and increased safety. the Prep SFC 100 control software. Due to its compact design the footprint of the Prep SFC 100 system is comparatively small and precious laboratory space can be saved. The clear arranged assembly of the Prep SFC system allows easy access to all of its components. The fractionation module of the Prep SFC 100 system includes a selector valve and a gas / liquid separator. It is designed for 8 sample bottles with a volume of 1 litre each. Due to the flexible outlets even bigger sample containers with volumes up to several litres can be used. The user-friendly control software can be used via the 10" touch screen, which is placed ergonomically on the upper front of the Prep SFC 100 system. A separate computer and a monitor are unnecessary, additional bench space is not required.